On September 11, 2001, I was employed in New York City at a job that I would soon vacate in favor of teaching martial arts professionally. On that tragic but stunningly brilliant morning, I stood on the corner of Fifth Avenue and Nineteenth Street watching the destruction of the World Trade Center unfold before my very eyes. It is nine years hence and that fateful day is still vivid in my mind. Seconds after seeing the second plane slam into the South Tower, realizing full well that this was an assault on our country equal only in magnitude to the infamous attack on Pearl Harbor, I quickly made the decision to leave the city to seek the safety of my home and family sixty miles away. Convincing a business associate that it would be best to flee the ensuing confusion, we shot up the FDR Drive in his car, listening as an incredulous radio personality announced the attack on the Pentagon, the crash of an airliner in Pennsylvania, and ultimately, the collapse of the Twin Towers. Anyone locally who bore witness to the rapidly unfolding disaster will appreciate the shock we both felt. Almost three hours later, after plucking my children from the chaos of a terrified classroom and attempting to calm my wife upon our return home, I sat in my study fielding telephone call after telephone call inquiring as to my safety. Most were communications with friends and relatives, yet a significant amount of the calls originated from frightened and disoriented students. Was I safe? Is our taekwondo school open? Would classes be held today as scheduled? Answering in the affirmative to all three questions, I drove to the dojang with one thought in mind: as a martial artist and school owner who realized there was little any of us could personally do at this point, it was my mission to provide a sense of security and shelter for my anxious students. While people were flocking in droves to homes, social centers, and churches in every corner of the county, our students, who sought tranquility in taekwondo, were resolutely making their way to a place familiar to them, a place that offered a sense of community and collective comfort from the staggering events of the day. I will never forget the mood in the dojang that evening. Yet I was not surprised given the literal translation of dojang—a place to study The Way. The tragedy brought our martial arts family together as a unit. Defined by our doboks, belts, and the rituals of our art, we began to train. Slowly the spirit of taekwondo took hold until—at least for a few hours—we enjoyed a respite from a world on the threshold of our community gone haywire. What was it about this physical space that worked its magic on us? What profound distraction could possibly supplant the mind-numbing sensations that roared through our brains like a hurricane, resonating in our bones? It is not unusual for taekwondoists to feel a sense of comfort when they step into the dojang, a familiarity that adds consistency to an often hectic life. This is especially true when business or family matters result in a short-term absence. Returning, the practitioner crosses a spiritual boundary onto the training floor in the wake of the required bow of respect, glances in the mirror, and seeing his or her reflection is reminded of the nobility and perseverance associated with a diligent study of the traditional martial arts. Furthermore, it is here in the dojang that a mutual respect is forged between those with a common goal, replacing the daily tug-of-war found in the workplace, schoolyard, or playing field. There is a giver and receiver of technique that alternates between individuals. In an extraordinary display of self-control, practitioners of all ages and both genders lend their bodies to one another in an effort to achieve personal excellence through the practice of an ancient and evolving art. In the ebb and flow of self-defense, one strikes, another blocks; one sweeps, another yields. It is this strange dance that promotes courtesy, focus, and reverence for tradition in the martial artist. Only in the safety of the dojang can these skills be fostered since it is understood what happens here remains here. Moreover, a traditional dojang is built for utility and veneration of the art. Our national flag and that of the Republic of Korea adorn the wall. Sometimes, a scroll composed of rice paper scripted with calligraphy decorates an honored space, its flowing brush strokes representing a principle or ideal unique to the martial arts. Too, it is not a place devoid of color; often the training floor is covered with the bright array of a puzzle mat, radiating a pattern of contrasting hues. Aside from being a feast for the eyes, its functionality serves to protect the practitioner from the throws and sweeps found in traditional taekwondo. If mirrors are present, they are constantly wiped clear of smudges and fingerprints since the cleanliness of the dojang and all that it contains is a direct reflection of the technical precision expected from the students who fill it. Kicking targets, like a column of soldiers, hang on hooks in rows so neat a drill sergeant would approve. Although authentic taekwondo is defined as a weaponless art, some schools cross-train in other Korean martial arts. If kumdo (The Way of the Sword) is a featured, secondary discipline, jook do, or bamboo swords, are to be found within quick reach. Likewise, bong, or fighting staff training, can be added to promote upper body strength and coordination and to act as a supplementary tool suited for self-defense. 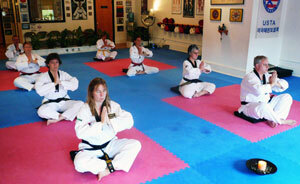 The dojang is also a place for meditation and Ki development. This perhaps was the single most cleansing component of the traditional taekwondo core curriculum that satisfied our need for clarity on that infamous day. As we sat, hands resting in our laps describing an ancient mudra or hand gesture, eyes closed, feeling the smooth exchange of breath push away distraction, our minds soothed, a welcome calm began to pervade the room. And so on that sunny September afternoon—a day that through the mercy of the mind is, for many of us, beginning to seem so distant yet will never be forgotten—all these elements conspired to provide a shell of serenity for those within. The surrounding four walls, floor, and ceiling, that without their customary ornamentation could be construed as a mere room, combined to create a space to breathe and to organize emotion as we attempted to make sense of it all. For this is no ordinary living space; it is an environment filled with a courage commensurate with the rich tradition of the Korean martial arts. It is a dojang, a safe haven, a place to study The Way.